The tumor suppressor protein p53 interacts with a number of proteins to mediate its pleiotropic effects (Giaccia and Kastan, 1998; Levine, 1997). 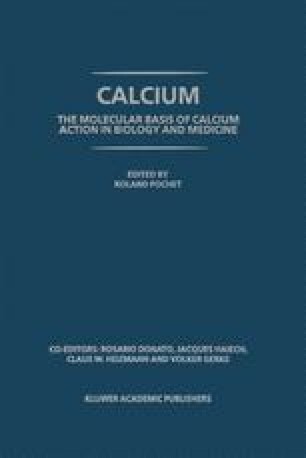 The Ca2+-dependent interaction of p53 with members of the S100 calcium binding protein family is of particular interest since like p53, these dimeric proteins affect cell cycle progression and are overexpressed in numerous tumor cells (Donato, 1991, 1999; Heizman, 1999; Ilg, 1996; Kligman and Hilt, 1988; Schafer and Heizmann, 1996; Zimmer et al., 1995). For example, reactive gliomas have as much as 20 times more S100B (ββ) than in non-transforming cell lines (Donato, 1991). Increased levels of S100B (ββ) are also found in renal cell tumors and malignant mature T-cells (such as doubly negative CD4−/CD8− adult T-cells in leukemia patients). As is the case for S100B(ββ), a number of other S100 proteins are often upregulated in cancer (Kligman and Hilt, 1988). For example, S100A1, S100A6, and S100B(ββ) are elevated significantly in metastatic human mammary epithelial cells (Schafer and Heizmann, 1996), and increased levels of CAPL (S100A4) in transgenic mice induce metastatic mammary tumors (Barraclough, 1998; Sherbet and Lakshmi, 1998). In the case of S100A4, expression of antisense RNA to S100A4 suppresses metastatic potential for a high-metastatic Lewis lung carcinoma (Barraclough, 1998; Sherbet and Lakshmi, 1998). In addition, protein levels of S100B(ββ), S100L (S100A2), S100A4, and S100A6 correlate with malignant melanoma as detected by antibodies specific for each protein (McNutt, 1998).